Flippagemaker Image to PDF Converter is free converter that can be used to convert multiple images to PDF files. It is professional image converter that provides flexible settings and output types. With this image to PDF creator, images can be built to one PDF or multiple PDFs, export PDF can be share via Email and uploaded via FTP, and you can also append or merge the created PDF to existing PDF file. 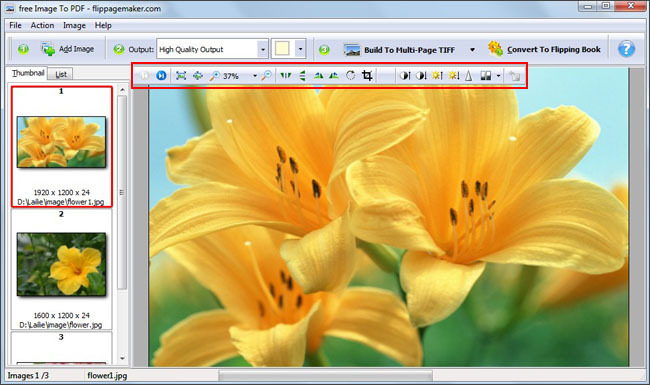 When you want to create a PDF file but not own any PDF creator, you can create PDF pages as JPG images at first, and then merge all JPG pages into a PDF file with this freeware. There is a full flexibility to choose the pdf page size. The application is intelligent to resize or resample the images and fit them into the pdf pages. The image to pdf converter also allows setting the Meta data (title, author, keywords and subject) of the output pdf. It is not simple tool with simple functions. However, there are many useful functions that will bring practical help. vPDFc RTF to PDF Converter (Popularity: ) : The application is a text converter (RTF to PDF). The user can select a source .rtf file and then choose a destination file(.pdf). The RTF file is converted to PDF file. Based on vPDF @ http://sourceforge.net/projects/vpdf but supports text alignment.